Are your friends in need of a getaway? Perhaps just a day of pampering? The Day Spa can cater for larger groups with prior notice. Join with a group of friends and make a day or weekend of it. You can turn a Spa Party in to quite the retreat by pairing your party with a day or two at our Bed & Breakfast. We will make sure your party attends Olympia’s best restaurants, arrange for theater tickets to any of our great live local theaters. 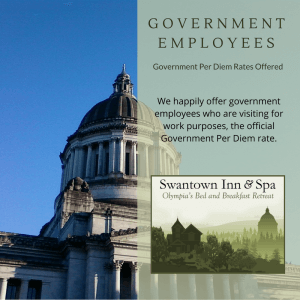 It will be a getaway everyone will be talking about for years to come, whether you live locally in Olympia or Washington State, or clear across the country or globe! 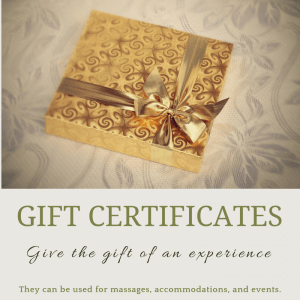 Packages for Spa Parties include one or more of our guest rooms. With our new Puget Suite capable of accommodating up to 6 guests, it is the perfect room to book for a Spa Party. Two by two your guests can visit the day spa where our licensed massage therapists will work their magic! Meanwhile the rest of you can relax in the private lounge of the suite. So for around $1000 you and five of your friends can spend one night, and during that day all get massages. Smaller and larger groups can rent our other rooms, each of which accommodate two guests. Note that Spa Parties need to be booked in advance, so we can make sure there is availability in spa for your entire party.